There are no squirrels in Australia. Strange, I know, but there it is. You can travel across the world and what do you notice? An absence of bushy tailed rodents. I envision Australian tourists coming to the U.S. and snapping photos of squirrels in the park. "My word, Matilda, there goes another one!" "Quick, Clyde, before it gets away!" Certainly it's no more strange than an American tourist walking through Hyde Park in Sydney snapping photos of black-billed ibises. 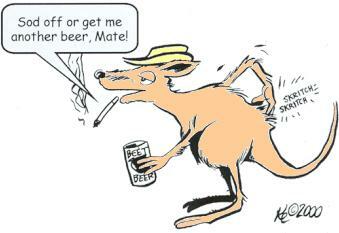 They may be as common as red dirt there, but it's startling to those of us not from Down Under. You'd be walking through the park, feeling like you could have been in any major North American city and suddenly what would qualify as an avis rara round these parts crosses in front of you and you realize you're not in Kansas anymore. The toilets are very cool. All the buildings we frequented, with the exception of the very oldest, featured two flush options: light load and heavy load. Now, if you're a woman with a bladder the size of an acorn who drinks water all day this is a neat thing. Instead of wasting ten gallons of water every time you take a trip down the hall, you only use the minimal amount necessary for the moment. Sometimes it took a bit of guesswork to figure out which flush button was which, but it was worth the effort. You'd exit the bathroom feeling like you'd done just one more thing to help out the environment and save our precious natural resources. How come we can't get good dairy products like the Aussies get? The milk, cheese and butter all had more flavor than what's found in most American supermarkets and the variety was outstanding. The yogurt in particular tasted like more than flavored library paste. Oh yeah, and how come we can't get flavored tuna in individual little cans in the States? Or at least I can't get it. They get grubs and little tins of tuna. We get Cheez Whiz and Wonder Bread. Aussie Rules Football, or 'Footy'. I'm not a sports fan. Definitely not a football fan. But my traveling companion sat me down in front of a television in our hotel room with instructions to just watch. Twenty minutes later I turned to her and said, "If American women saw this it could change Sundays in the States forever." It was fast. It was easy to follow. But best of all, instead of 250 pounds of overfed, overpaid, overpadded beef hurtling down the field you had hunky young guys in shorts and sleeveless jerseys playing in the mud. Real looking men, not caricatures. Eye candy for the ladies. You get the idea. Flying foxes in the Sydney Botanical Gardens. They look like refugees from a Dracula movie, hanging up there and waiting to swoop down on unsuspecting tourists. Or at least that's how they looked looming over us. More food: Sticky date pudding. It's a moist cake with chopped dates and sauce on top. Good stuff but it helps to have a well-seasoned sweet tooth, able to handle something a bit cloying. But cutting through the sweetness is helped by the coffee. Most of the time, when I ordered a cup of coffee what I got was an eye-poppingly strong espresso. That would cut through anything, including the fog of jet lag. Oh, and the Anzac biscuits! A modest little oatmeal and coconut cookie with a history dating back to the Great War, the Anzac biscuit is a delightful taste of Australia. Within three days of my return home I began to experience withdrawal symptoms and did a web search for Anzac biscuit recipes. Not surprisingly, there were as many variations as you would find for a standard American chocolate chip cookie, but with a little adjustment and a hunt for the proper ingredients (it's hard to find wattle seeds around here) I was able to bake a batch and got rave reviews from family and neighborhood kiddies. Blue lights in the public restrooms. Took me a while to figure out what was up with this. Was it to sanitize? Was it to make you look like a corpse while putting on makeup? Finally, I saw a sign explaining the lights. Blue lighting discouraged drug use. Sure enough, the next time I looked at my arms under blue lights it was harder to see the veins. There were also convenient and discreet needle drop boxes for those who needed them. Public transportation. I'm sure it's not great everywhere you go, but in the cities we were in it was fast, convenient, reasonably priced and perfect for tourists like us staying out burbs. The Melbourne trams were especially convenient, though the Sydney bus system was also very good. And the trains running to the outlying areas were a big improvement over driving. The money. It's slick, it's plastic, it's colorful. I imagine Aussies coming to the States must find our money very boring. I know I do. The coins decreased in size as their value decreased with the five cent piece the smallest. Paper money too varied in size as well as color making it much easier to handle. And, since the Aussie dollar was worth about two-thirds of the American dollar, you could get lulled into thinking you were getting a bargain -- if the price looked good in American dollars, you knew it was a deal! The airlines! Oh man, I'll never feel the same way flying domestic US airlines again. On a 90-minute Qantas flight, passengers got two snacks. First, a bag of crackers and juice. Then, a meat and cheese roll, fruit salad, cheese, crackers, and Anzac biscuits and a Cadbury chocolate bar! The vegetarian tray that we got had a fruit plate in place of the sandwich. Ah, airline travel the way it was meant to be. The Sydney Aquarium. A great way to get up close to the aquatic wildlife of Oz without having too close an encounter. An Australian saltwater crocodile made me feel just a bit inadequate as a Floridian. Size does matter. Our bull gators don't quite measure up. Uluru (Ayers Rock) and Kata-Tjuta (The Olgas) National Park. Everyone's seen pictures of Uluru, but the pictures can't compare with the reality. It looks very sfnal, rising out of the red ground, a huge red monolith surrounded by kilometer after kilometer of desert. And the ground itself! Georgia has red colored clay but this dirt is red, a really deep, rich, lush scarlet. Uluru itself changes color as the day changes. In the morning and at sunset you see purples, blues, greys, all melding and blending as the light moves. During the heat of the day the rock is a majestic ochre, catching and reflecting the sun's light back to the desert. It's offset by a sky of a deep cerulean hue, clear and absolutely cloud free during the dry season when the humidity is at about one percent. Visiting the Rocks is one of those special experiences that make you appreciate the variety and wonder of life on this planet, and how fortunate we are in this day and age to be able to travel to these sites. The Floriana hotel in Cairns. "Charmingly rustic" doesn't do it justice. The Floriana is a family owned inn, a somewhat run down Art Deco treasure oozing faded style, rather like a retired chorus girl dripping with Bakelite and rhinestone jewelry from her youth. The Floriana had Deco furniture in the lobby, plank floors, and an eye popping pink, blue, yellow and turquoise color scheme. The outside was draped with strings of colored lights. We had a suite, a bedroom and sitting room with a second bed. The sitting room had bay windows opening onto the east and the Bay and I was thrilled to think of sleeping with the fresh sea breezes coming in, the birds awakening me with their gentle morningsong. So after a stroll down the Esplanade, the funky, tacky, backpacker-filled main drag of Cairns we returned to our little treasure, the Floriana, and settled in for a good night's sleep. I drifted off to the night sounds of returning guests and the rustle of the breeze through the palms. All was calm, all was quiet. And then came the black helicopters. Turns out our charmingly rustic digs were next door to a regional hospital that serves Cairns and surrounding environs and many of the patients are flown in by helicopter. In the middle of the night. To a helipad next to my room. Now, I'm not a light sleeper but I guarantee something right outside your window going WHUP WHUP WHUP and making enough noise to wake the fish in the Great Barrier Reef at two o'clock in the morning will roust anyone out of bed. And at three o'clock. And at four o'clock. And my travel companion, who'd taken the interior room after I insisted I wanted to sleep near the open windows slept like a baby. But really, the Floriana is a great place to stay. Once. The Great Barrier Reef was, as promised, spectacular. Even if you're not a scuba diver the tour companies offer many options for seeing the reef from Green Island. My favorite was the Yellow Submarine. It took you below the surface and around the reef where you could look out portholes and admire the fish. Kind of a real life version of Captain Nemo's Submarine. In the Melbourne area there's Healesville Sanctuary, the largest collection of Australian wildlife available for viewing in one spot. And yes, Virginia, there were koalas and they were adorable, but so were the echidnas, penguins, wombats, Tasmanian devils and the variety of birds. The only disappointment were the roos, who were clearly on the dole. There they sat, lounging, scratching their butts, smoking cigarettes, ignoring us, barely moving. Their attitude couldn't have been plainer. "Tourists? We don' need no stinkin' tourists!" I found out afterwards that kangaroos are most active around sunrise and sunset when they're feeding. Otherwise their attitude is "bugger off, mate!" And the Royal Melbourne Zoo with its butterfly room is also a delight. Lonely Planet travel guide says the Zoo is "one of the oldest in the world but it is continually upgrading the standard of the prisoners' accommodations." The 'prisoners' seemed content when we were there and included a platypus in a nocturnal environment and some friendly penguins. Were there negatives? Sure. The graffiti was widespread, annoying and pervasive. Canned beets are considered a basic food group. I never imagined I'd be ordering fast food and saying "hold the beets." But other than graffiti and beets, I'd recommend Australia as a vacation spot for any Yank looking to go someplace with friendly natives, interesting sights and people who almost speak the same language. I hope to return someday to see many of the things I wasn't able to cram into this trip and spend more time learning about the people and places of the Land Down Under. Oh yeah, and they had a nice SF convention in Melbourne too. Eric Lindsay, who lives in Australia, wrote us he was "Glad Eve realised exactly what the Aussie Rules Football was aiming at, with their teams in short shorts and playing in the mud. Just moving with the times." Ron Bennett, who lives in England, wrote us that "I picked up more new facts about Oz in three pages than I've learnt in a lifetime. Many of the things which impressed her were the things which amaze me about the U.S.A."
The other articles in M25 included the final installment of Mike Resnick's "Worldcon Memories," Ron Bennett's description of his trip to the final solar eclipse of the millennium, John Foyster's remembrance of 1960s Sydney fandom, Dave Kyle's remembrance of the New York Hydra Club, and Forry Ackerman's visit to Sweden. And, in a fanzine themed for a far-away event, we also featured a short article from a famous stay-at-home fan.